The Marina 360 / Marina Splash Replacement Filter Cartridge, with carbon and zeolite, improves water clarity and colour while removing pollutants and odours. This replacement filter cartridge is designed for use with the Marina 360 Aquarium and the Marina Splash Aquarium. 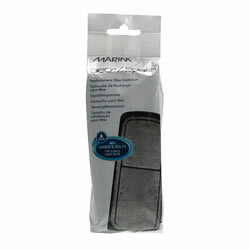 The Marina 360 / Marina Splash Replacement Filter Cartridge comes in a pack of 4. For best results, replace 1 cartridge every 2-4 weeks.